Camdeboo National Park is characterized by its breathtakingly stark landscape. The Camdeboo National Park stretches across 19 405 hectares and literally surrounds the Eastern Cape town of Graaff-Reinet. The park's Nqweba Dam, when full, covers a substantial part of the park. The valley is barren, characterized by its huge dolerite pillars, some of which are 120 meters high. This region, known as the "Valley Of Desolation", is the most popular attraction in the national park. Some people refer to the Valley of Desolation as the 'Cathedral of the Mountains', as it provides a spiritual experience for many visitors who are moved by the eerie silence and the uniquely stark beauty of the place, providing them with a deep awareness of the amazing environment. Camdeboo National Park offers a number of different walking trails, ranging from walks that last an hour to extended hikes where overnight camping is required. There is also a picnic site for those who simply want to revel in wonder at the strange and magnificent rock formations. There are 43 mammal species found in this park. Visitors stand a good chance of seeing steenbok, black wildebeest and blesbok when driving in the more open areas. Animals that enjoy the thickets include the kudu and grey duiker. The Cape buffalo is not seen that often, but red hartebeest and gemsbok are frequently spotted. The Cape mountain zebra will sometimes be seen, but it is mostly found in the mountainous parts of the reserve. We stare ardently at man-made structures such as the Colosseum (48m high), the Statue of Liberty (46m high) and the famous soapstone Christ the Redeemer (38m high) looking over Rio de Janeiro in Brazil, but nature is the ultimate builder, sculptor and artist. The dolerite pillars that reach heights of 90-120 meters found in the park leaves visitors feeling overwhelmed and humbled. The dolerite pillars can be found in the famous Valley of Desolation, a geographical wonder that is millions of years old. The magnificent volcanic, corrosive handiwork of Mother Nature is abundantly clear when the sheer cliffs and rock formations are viewed from the park's many scenic routes and picnic sites. This is not what you would expect from a park set in the middle of the Karoo, but the plains at the foot of the Sneeuberg Mountains are paired perfectly with the Nqweba Dam and a variety of animals, birds, reptiles and even fish can be found in the area. To top it off, a diverse range of plants and flowers add a multitude of colors to the expanse. 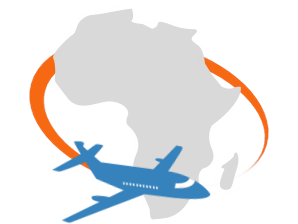 Both Cape Town and Port Elizabeth airports are easily accessible from all major airports in South Africa and daily flights are also available between the two. The departure point to the Camdeboo National Park will vary depending on your specific combination of destinations, although the preferred final flight destination is Port Elizabeth because it is closest to the park. The Camdeboo National Park is remarkably situated around the historical town of Graaff Reinet, on what was known previously as the Karoo Nature Reserve. It is approximately 600km from Cape Town International Airport and 250km from Port Elizabeth Airport. Visitors to the park will be transported via private, air-conditioned vehicles from one of the above airports depending on their package. The Camdeboo National Park is located in the eastern parts of the Great Karoo, which experiences rainfall predominantly in the spring and summer seasons, often accompanied by thunderstorms and high temperatures. The winters are cold, and snow can sometimes be seen higher up in the mountains. It is best to visit the park in spring or early summer, from August to November, when the wildflowers start to bloom and the newborn antelope can be seen amongst the herds, grazing on the shrubland. It can get very hot, however, and it is best to arrange strenuous activities such as hiking in the early mornings or late afternoons. Graaff Reinet is the fourth oldest town in South Africa. Founded in 1786 and built on the banks of the Sundays River, its cultural and historical attributes such as the Dutch Reformed Church and the Reinet House Museum attract multitudes of visitors throughout the year. The Camdeboo National Park, previously known as the Karoo Nature Reserve, surrounds the old town. The Karoo Nature Reserve was established in 1979 when the need to conserve the Karoo biome was recognized by various private landowners and the World Wildlife Fund in South Africa. The reserve was donated as the flagship of the South African National Parks’ initiative to further conserve the biome in the area. The park's history, however, stretches millennia. Geologically and archaeologically rich, from the obscure dolerite pillars to prehistoric fossils, it is almost impossible to grasp the natural abundance that occurs here in what some - mistakenly - think of as barren lands. Evidence relating to Stone Age dwellers has also been found within the park, and the confirmation of their occupation of the area can be found along the Sundays River to the Eastern Cape coast. Rock paintings, shelters and various tools used by the nomadic people to hunt, fish and harvest wild foods have been found in the area. In the 1600’s, the Inqua tribe and their cattle and sheep called the park home. A well-adapted group of animals can be found in the Camdeboo National Park. This is necessary because the Karoo becomes extremely dry, and conditions are unpredictable. The 43 mammal species include antelope like springbok and kudu, lesser mammals like vervet monkeys and meerkat, and rodents and carnivores such as the bat-eared fox. Amphibians are also not shy to the area, and various frog, lizard, tortoise and snake species can be found. The reptiles live in great numbers all over the park, but seldom come out during the heat of day, preferring the shady crevices of the rock formations for some relief from the high temperatures. Over 250 bird species have also been documented in the area, one of which is the ostrich, which has adapted perfectly to the Karoo environment. Birds that can be seen in the area include storks, rock kestrel, Diederik cuckoo, brown-hooded kingfisher, Namaqua dove, cardinal woodpecker, speckled mouse bird, long-billed crombec, and ant-eating chat. Various hawk and eagle species, including the black eagle, have been spotted, and an assortment of water birds like flamingo can be seen in spring and summer. The Nqweba Dam also hosts a number of fish and serves as an attraction for the multitude of birds and birders. The Karoo is very dry, but it is referred to as semi-desert environment due to its annual precipitation. The plant types vary from season to season, and the unpredictable weather patterns and diverse altitudes add to the fluctuations in biodiversity. Shrubland is located on the higher altitudes and the vegetation is separated from the grasslands. Conversely, the dwarf shrubland that is found in the lower parts of the park shows various signs of inter-clumping. The last dominant vegetation type found in the park is the succulent thicket which, as is evident from its name, encompasses the various succulents or 'fat plants' (translated directly from Afrikaans), such as the aloe. The park is dominated by geological anomalies resulting from over a hundred million years of volcanic and erosive events. 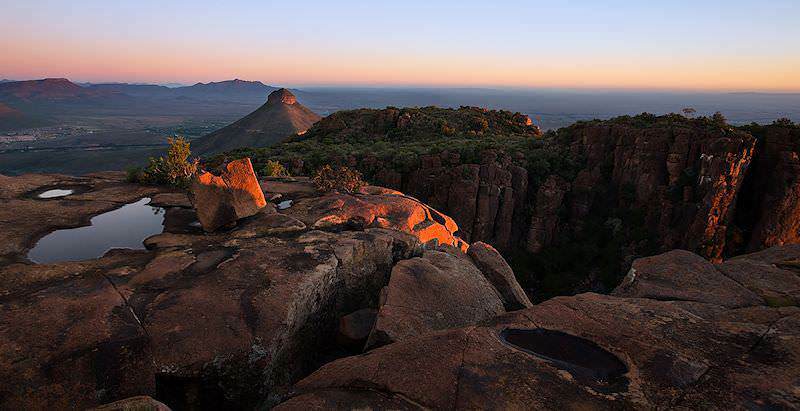 It is famous for its natural wonders like the dolerite pillars and sheer cliffs found in the Valley of Desolation, as well as the strange shaped mountains, such as Spandoukop, that forms part of the silhouette of the Karoo. The ecosystem found in the park is extremely adaptable and the various role players are able to recover swiftly from various volatile situations such as droughts and insect epidemics. However, areas of the park are still in a transitional state due to the effects of veld mismanagement prior to 1979, when the area was used communally and often overgrazed. The expansive and naturally diverse landscape of the Camdeboo National Park offers a wide range of activities for visitors. It is every landscape photographer's or cinematographer's dream, and epic footage can be acquired from wherever you find yourself in the park. A drive or hike up to the Valley of Desolation is a perfect way to explore the park and get a bird's eye view of the panoramic setting. The various day and overnight hiking trails also make for excellent wildlife viewing, which includes the springbok, ostrich, kudu, grey duiker, red hartebeest, meerkat and sometimes even the Cape mountain zebra. Bird watching is also outstanding, especially at the Nqweba Dam, and the Graaff Reinet Birding Club are regular visitors to the park. The Nqweba Dam also allows for various water-based activities to be enjoyed, such as fishing, boating, canoeing, skiing and even windsurfing (weather permitting, of course). There are also many braai and picnic spots along the dam and up the mountain where guests can relax and enjoy the scenery. 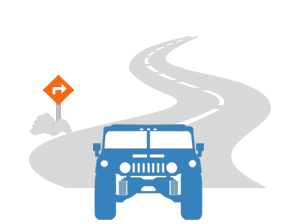 For the more adventurous, there are two 4x4 trails of varying difficulty in the park. You can contact us if you would like to book specific adventures in advance or if you’d like more information. Your experiences in Camdeboo will highlight the park's remarkable isolation in the belly of the Little Karoo. Savor the silence and solitude and keep an eye out for wildlife that you may usually overlook in more game viewing-oriented parks. There is something remarkable about standing quietly on the various precipices surrounding the Valley of Desolation. The deafening silence that embraces the rock-faces tells a story without saying a word. It narrates a hundred million years’ of Mother Nature's power and eternity, and when compared to our human frailty, the experience is almost otherworldly. You will definitely enjoy seeing some of the stranger creatures, from 'jumping antelope' to earthbound birds. The white faces and golden coats of the springbok can be seen hopping (their name is derived from the word jump) over the plains. They are joined by the flightless ostrich, the largest bird in the world, which is also one of the most fascinating of creatures. The park's setting - being amongst one of the oldest natural wonders - at the foot of the mountains, next to a dam, close to a river, surrounding one of the oldest towns in South Africa and being home to a multitude of animals, birds and plants – depicts beauty and life, no matter what direction you are looking at. Waking up for early fort the sunrise is worth it every time. How high are the Sneeuberg mountains? The highest peak of the Sneeuberg mountain range is called Compassberg, which is 2 504m high. How big is the Nqweba Dam? The dam has a capacity of 46 369 000 m³. The dam wall is 46m high and 357m in length. What is the Valley of Desolation? Often called the 'Cathedral of Mountains', the valley is made up of dolerite pillars and cliffs. A dolerite is a volcanic rock formation. The dolerite pillars at Camdeboo are pillar-shaped and reach heights of up to 120m. WiFi is available at some of the accommodation options, but contact us if this is a preference. What other destinations should I combine with the Camdeboo National Park? The Addo Elephant Park just outside Port Elizabeth is the only park in the world to conserve 'the Big 7', and would make a fine extension to your safari. Yes, and there are various child-friendly activities in and around the park. South Africa's top destinations include the Kruger National Park and Cape Town. Travel to Namibia for a rousing range of desert-oriented safari activities. Often overlooked as a safari destination, Zambia offers truly rewarding travel experiences. Zimbabwe's most alluring destinations include Mana Pools and Victoria Falls. Mozambique is a vast coastal country known for its tropical spoils. The Kruger National Park's extraordinary diversity and rewarding game viewing opportunities make it a popular safari destination. Sabi Sand is one of the finest private game reserves in Southern Africa, hosting world-class lodges and an incredibly high frequency of leopard sightings. Cape Town is a world-class, cosmopolitan city that is also able to offer a remarkable wealth of exciting outdoor pursuits. Travel to the Garden Route for adventures as diverse as exploring subterranean caves and walking alongside a cheetah in the forest.